Using the wrong DNS server for your PS4 or Xbox One can crush your ping time, or worse — actually lower your connection speed. In fact, most gamers are just using whatever default DNS servers your ISP (internet provider) assigns, and these are almost never the fastest DNS servers. But the good news is that your competition is slower than necessary, which means by following the tips in this guide, you may be able to quickly and permanently gain a real speed advantage on your foes. DNS stands for ‘Domain Name System’ and it’s basically a telephone book for the internet. DNS servers tell your PS4/Xbox where gaming servers (or websites) are physically located on the world wide web. Any time you contact a gaming server, a gaming peer, or a website, you’ll use DNS. What does DNS have to do with speed? Any time your PS4/Xbox performs a DNS lookup, it will take a certain amount of time based on how far away and how loaded the server is. But DNS queries don’t actually happen that often. So can the wrong DNS server actually lower your speed and ping time? Even though the internet seems like it should be the same for everyone, it’s actually a series of interconnected information highways — and some of these are slower than others. The fastest, backbone networks are called Tier-1 networks, and if you find your traffic routed through a Tier-1 pipe, you will get faster speeds. And here’s the amazing little secret… the DNS server you choose can actually affect whether your gaming traffic gets routed to a Tier-1 backbone, or a slower (sometimes much slower) route. This is why it’s often possible to boost speeds by 25%, even 50 or 100% simply by optimizing your DNS servers. These are these fastest, free DNS servers that anyone can use to evade censorship and improve speeds while gaming. Make sure to check out the next section where we’ll show you how to quickly test and choose the fastest DNS for your location (the optimal server is different for everyone). Also, if you’re looking for the quickest solution (no testing) with decent results, choose either Cloudflare or GoogleDNS. They consistently score among the fastest. There two ways you can test the available DNS servers to find out which one is the fastest for you. Automated Test using Namebench: Use this free Google-created software from 2010 to automatically (and repeatedly) test multiple DNS servers to measure speed and response time. Manual Test: Change DNS servers one by on your PS4 or Xbox and the speedtest them individually. If you’re super-serious about speed, you may want to combine these two methods. First run Namebench to get the 3 fastest options, then test them each manually on your gaming system to see which performs the best in real-world conditions. To install and use namebench, follow the instructions below. For manual testing, simply use the guide in the next section that will teach you how to change DNS settings on your preferred gaming system. Namebench was a little sideproject from Google (not for profit) that has been released publicly for free. The code hasn’t been updated since 2010 so there are a couple quirks, but it still works perfectly for our purposes. Here are the download links for the final Mac and Windows releases of Namebench, or you can visit the official downloads page to install whichever version you like. Extract and run the installer (Windows) or drag the .dmg to your applications folder (Mac) to install Namebench. To test your list of possible DNS servers, simply copy and paste (or type) the IP addresses into the ‘Nameservers’ field of Namebench. The IP addresses should be separated by a comma and a space. Test regional (non-global) DNS servers (takes longer). Query Data Source: Choose what websites/metric you’re testing. We like the top 2,000 Alexa test. Number of Queries: How many times each server will be tested (to increase accuracy). 50 is a good place to start. The higher the number, the longer the test will take. After the test has completed (can take well over an hour depending on the settings) the results will load in a new browser window. For some reason, in our the results loaded in Microsoft Explorer even though it’s not the default browser. The quirks of old software I guess. You ignore all the comments about ‘hijacked’ DNS in the right column. It’s because the IP addresses of those websites has changed since 2010 (the last time Namebench was updated). UltraDNS isn’t free. 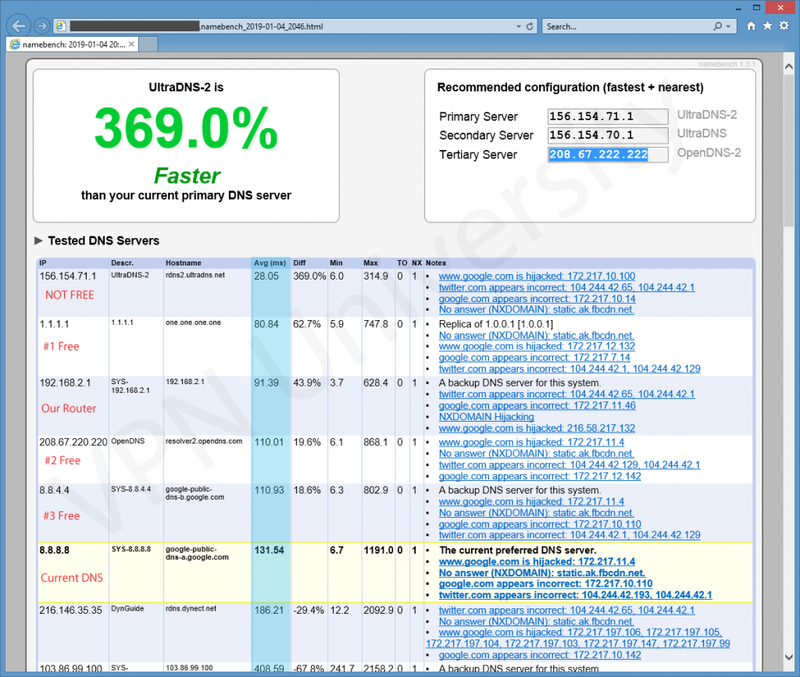 In our test, UltraDNS (one of Namebench’s defaults) had the fastest response time, but it’s not a real option. It’s not a free service, but is a paid professional DNS server used by large businesses. The server with the fastest response time will not necessarily be the one that results in the fastest gaming speeds. Looking at our results: in our test, the current windows DNS server was set to 8.8.8.8 (primary) and 8.8.4.4 (secondary). The server with the fastest response time was UltraDNS. Unfortunately, this service isn’t free, so it’s not a viable choice for us. The 192.168.2.1 result actually belongs to the our router, implying that the DNS configured on the router outperforms our current DNS (Google) configured in windows. But Cloudflare was fastest of all. What to do now? Take your top 3-4 results, and manually test them (covered in the next section) to see which one yields the fastest speeds. Then configure your DNS servers to be the Primary and Secondary IP addresses for that service. This section will show you how to change the DNS settings on your PS4, Xbox, or directly on your router. Each device has it’s own section below. Choose your connection type (Wifi/LAN, LAN is much faster). I’m not gonna lie, this article was a LOT of work (and research). So, hopefully it makes a real difference some of you are seeing and a meaningful reduction in ping time. If you’ve had success (or heck even failure) let us know about it in the comments below. And one last thing to keep in mind; DNS settings should only be one component of your gaming speed stack (and it’s not even the most important). Obviously your overall connection speed cap is the most important, but to get the absolute maximum percentage of your allotted speed you should also try to use an ethernet connection (not wifi) for your gaming whenever possible. The speed loss, interference, and latency from wifi is significant, and I can pretty much guarantee that all the pros aren’t going wireless.